#BringBackOurGirls was the rallying cry all over social media this past spring. Now? The girls have not been seen again, the perpetrators are onto even more heinous crimes and Twitter is onto #Seahawks and #BlueMonday. 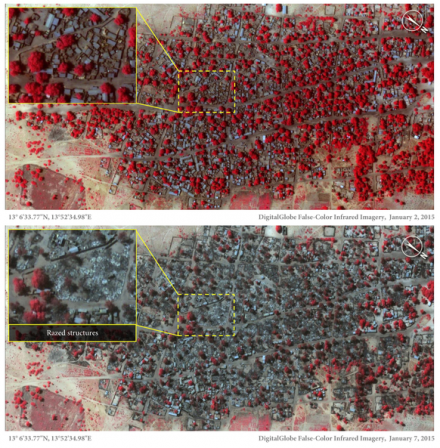 Boko Haram militants rang in 2015 by viciously attacking towns in northeastern Nigeria, including the densely populated municipalities of Baga and Doron Baga. Although Nigeria’s Director of Defence Information claims the death toll is around 150, Amnesty International argues that the numbers are gruesomely higher based on eyewitness accounts and satellite imagery. Victims’ reports to the nonprofit detailed the militants going from house to house to murder military age men, indiscriminate shooting at people of all ages and the rounding up of women, children and elderly folks as they fled into the bush which was dotted with corpses. According to Amnesty International, Boko Haram has been known to assault areas they believe to be collaborating with security forces and this may have been their motivation this time as well. Overall, Amnesty International has estimated 2,000 people massacred in this latest assault. So why has the 16 killed in the Parisian terrorist attacks at Charlie Hebdo and the market peppered our news, while many are more likely to be aware of the Nigerian assault via a Facebook post? Of course 16 people killed is 16 too many as 1 killed is 1 too many. Whether it is 150 or 2000 people killed, isn’t it 150 or 2000 people too many? I suppose 2000 is unfathomable in the human mind. Based on theories I heard from On the Media, Amnesty International and the Huffington Post, I am trying to understand why this is not a major headline in the Western news cycles. 1-Unfathomable. It’s a difficult thing for the psyche to swallow this level of atrocity in a place that can feel very far removed from their own lives. 2-Too Close To Home. An attack in Paris, a city that is culturally similar to cities in the United States, and an attack on the democratic ideals for freedoms of speech hits close to home; Americans feel on edge in line with the French. 3-All Quiet on the Eastern Front. President Goodluck Jonathan swiftly and sharply condemned the terrorism in Paris, and, yet did not offer similar condemnation in honor of his own citizens. 5. No Press Access From Boko Haram. At the present moment, it is near impossible to receive independent reporting from the attack sites in Nigeria as it is still under Boko Haram control; reports are mostly based upon eyewitness accounts and images from the sky. Of course, there are hashtags for the freshest atrocity in Nigeria, but there must be other ways to TRULY show that “#NigerianLivesMatter”. Kimberly Cecchini has this interesting blog post on Boko Haram attacks in Nigeria and the public perception which I can only recommend to our readers. It shows again the importance of not remaining silent in the face of terror and massive human rights violations. That said, RLADI will be back in the coming days with more new posts on human rights, international law and Latin America. Thank you for reading and sharing my piece! I am curious about the articles on your site now.